Can you name America’s largest youth development organization – empowering nearly six million young people ages 5 – 18? Here are some clues: a) a belief in the power of young people, b) “engaging youth to reach their fullest potential”, and c) the four leaf clover emblem. If you guessed the 4-H Club, you are correct! 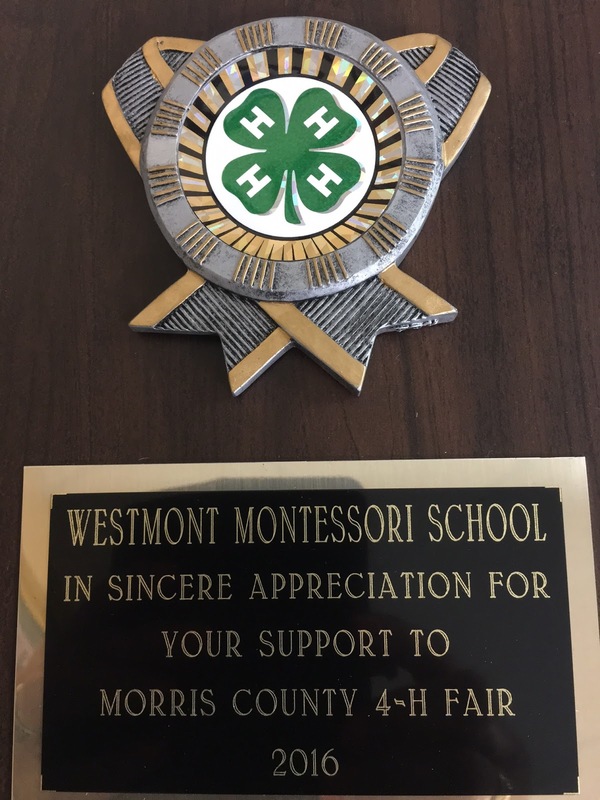 This past week The Westmont Montessori School was proud to participate and sponsor the Morris County 4-H Fair – an annual tradition during the 3rd week in July at Chubb Park, Chester, NJ. 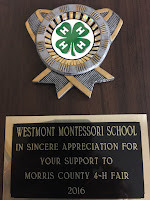 What struck me once more this year, as I engaged with the volunteer staff, the visitors, and the other non-profit organizations present at the event, was the similarities between Dr. Maria Montessori’s vision and 4-H’s vision. Both founded over 100 years ago, both equally committed to supporting children learn real-life skills that prepare them for the next stage of their life, both believing in the individual’s potential, and both supporting innovative thinking as a means to shape the young and how they will improve the world in the future. With this parallel vision, to encourage children to think for themselves, to discover, to question, to create, to lead and to collaborate, the world is in good hands. To find out more about 4-H please visit www.4-H.org . The job of the child is to explore the world and discover how he fits into it. To do this, he will test the limits of his environment and see what happens. Just as a scientist reproduces an experiment over and over again to ensure they have come to the correct conclusion, so too does the toddler. As parents and educators, it is our role then to provide an environment that has consistent boundaries and expectations, as there is nothing quite so frustrating to these "young scientists" as experiments that provide different results with each trial. With consistency in place, there are some key phrases that can help to ease the initial push-back that is sure to ensue when your toddler is met with a task they are less than eager to attend to. It's important to never ask a question that offers an unacceptable answer. Instead of, "Do you want peas?" Try, "Do you want one spoon of peas or two?" Instead of, "It's time to leave, okay?" Try, "We will be leaving in 5 minutes, so you have time to go on the slide three more times!" Giving a direct "no" answer to a child or giving a direct order can have the effect of igniting a tantrum, so a quick change of subject with a question is a good way to avoid this. Instead of, "No, you can't have candy". Try, "We are not buying candy today, but should we have strawberries or popsicles for dessert tonight? Instead of, "It's time for bed. Let's go brush your teeth"
Try, "It's time for bed. Should we brush teeth or put pajamas on first?" And when tantrums do begin, they can often be calmed with reassurance that you understand their frustration. Instead of, "Stop crying. You have to clean up before playing." Try, "I understand you don't want to clean up. You can go play as soon as you put your toys away." The true key is to respect that when a toddler is having a tantrum it is because she is feeling true frustration. By giving her clear boundaries, providing options, and keeping your cool you can help her to manage life's frustrations and learn from them. The expression most commonly used is ……stays together, yet it means much more than that. Today, family life is busier than ever. Even with summertime schedules parents are still getting children to and from activities: swim team, ball games, babysitters, camp, etc. The down days of summer are not always as carefree as we want. It is well documented that families that spend time together tend to have stronger connections and meal times can be a good time to do this. Below is an excerpt from an article from a family education website, offering some tips and support for the importance of doing what you can, when you can, to keep the conversation going. Family meals are much more than a time for children to sit at the same table with siblings and parents. Children crave ritual and family meals are a part of a routine they can count on and take comfort in. 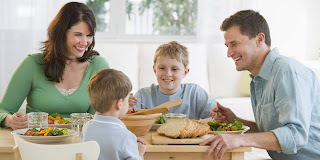 Mealtimes may be one of the only parts of the day when children get to talk with their parents without a lot of other distractions, including the television, cell phones, texts, games and homework. In fact, research shows dinner conversation boosts a child's vocabulary, which could translate into improved academic performance down the line. Lingering at the table to talk allows you to catch up on what's happening with your children. Go around the table and encourage each child to tell the rest of the family about his/her day. Breaking bread with your children allows them to model your behavior, which is necessary for instilling good manners. Eating together offers children the chance to see their parents eat a variety of foods, too. It's not always possible for all family members to be together at every meal. Don't worry about not being there all the time. Experts say that while eating family meals together fosters closeness and development, time spent together is what really matters. A few weeks ago we graduated our Kindergarten Class of 2016 here at Westmont. As our students move on from toddler, to preschool, to Kindergarten and to schools beyond these levels, we could not be more proud of our community of learners. As an educational stepping-stone for several generations, we feel a sincere and deep connection to all the capable young people and their families who began their life journey here. Westmont’s alumni are, at the core, Westmont’s legacy. As the core develops from young children to young adults to fully grown adults with children of their own, we look to continue our support of and our connection with our alumni as they progress in their academic and life journey. 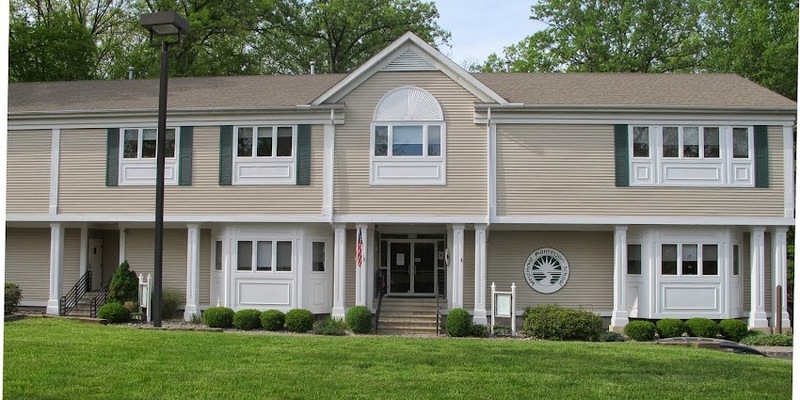 Fostering this unique relationship has helped us develop, shape, and enhance some wonderful opportunities to encourage their continued involvement with the school thereby advocating a life-long love of learning in accordance with The Westmont Montessori School’s mission. Whether it is returning to read as an elementary school child to old friends, visiting their former classroom or teacher, participating in the Jr. Camp Counselor Program, applying for the Legacy Scholarship, joining the Baby Sitting Team, attending our workshop on building the “Extraordinary Extracurricular List,” or having their own children now attend Westmont, the connection is life lasting for our Westmont family.